Boasting the same brilliant, lightfast formulations as Winsor & Newton Professional Watercolors, Winsor & Newton Professional Watercolor Sticks have a unique square shape that lets you lay down both broad and fine lines. There are many creative ways to work with these sticks. Use them dry to draw directly on your surface, then apply a wet brush to push, blend, and soften edges if desired. Or try dipping them directly in water for a variety of spontaneous effects. Super convenient and perfect for use in studios, outdoors, and on the go, the sticks measure 2½"L × ¼"Sqr and are fully intermixable with Winsor & Newton Professional Watercolors. Set of 10 — This set contains Alizarin Crimson, Burnt Umber, Cadmium Red Hue, Cadmium Yellow Hue, French Ultramarine, Ivory Black, Prussian Blue, Winsor Green (Blue Shade), Winsor Yellow, and Yellow Ochre. Draw with watercolor! 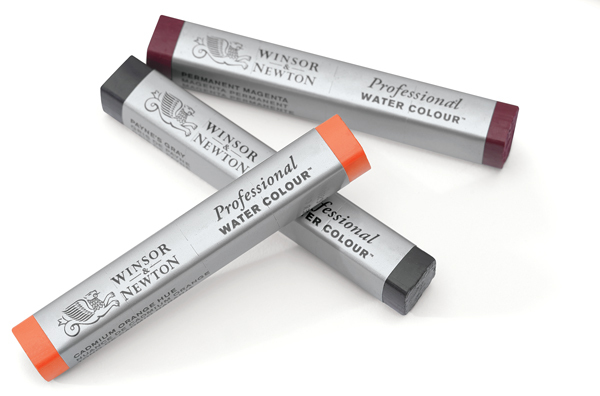 Boasting the same brilliant, lightfast formulations as Winsor & Newton Professional Watercolors, these Professional Watercolor Sticks have a unique square shape that lets you lay down both broad and fine lines. Use them dry to draw directly on your surface, then apply a wet brush to push, blend, and soften edges if desired. Or try dipping them directly in water for a variety of spontaneous effects.